Although many know Ann Druyan best at the wife of Carl Sagan from 1981 to Dr. Sagan’s death in 1996, she is also (among many other things) an Emmy Award-winning American writer and Peabody Award-winning producer, as well as the creative director of the Voyager Interstellar Record Project. Although many of you know my daughter by her callsign, “Deadly,” her full name is Eleanor Ann Arroway Tupper, the first three given components of which are the name of the protagonist of Sagen’s 1985 novel (and 1996 film), Contact. She goes by “Ella” in daily life and it thus far blissfully unaware of the burden that we’ve placed on her in terms of luggage monograms and federal tax forms. Mary and I sent a copy of Ella’s birth announcement to Ms. Druyan. The announcement explained Ella’s name and gave some background about why we chose it. Shortly thereafter, we received a very nice letter from Ms. Druyan, in which she congratulated us, explained the name of the character (Eleanor for Eleanor Roosevelt, Ann for Ms. Druyan herself, and Arroway as a play on Voltaire’s real name, “Arouet”), and the pleasant surprise that her family also cherished Kurt Vonnegut’s Eliot Rosewater baptism, which that we put on the front of the announcement. Since that time, I have written an e-mail to Ms. Druyan every few years with an update about Ella. I don’t have any particular reason to think that we loom large, small, or at all in Ms. Druyan’s thoughts. In fact, I admit that there are reasons to think that this practice might be regarded as creepy. But I do it anyway, always with the proviso that no response is expected. And that’s how we view the occasional e-mails to Ms. Druyan. As opportunities to compose messages to the cosmos. If it is odd to use Ms. Druyan as a proxy for the cosmos – well, one could do a lot worse. Here’s the e-mail that we wrote today. Just another artifact since the last one four years ago. Please don’t feel that you need to respond in any way. Being the creative director behind the Voyager Interstellar Records, you understand better than most that the composition of the message is the most important part of the exercise. Thus, I like to launch these messages on the same theory. It is, in some ways, arbitrary that your e-mail address is the one on the To: line but, just as spacecraft require a vector, so, too, do e-mails require an address. Eleanor Ann Arroway Tupper (“Ella”) turned 12 earlier this month. Ella and I visited and toured Fermilab in May and Aricebo and the VLA are on the list for the next few years. She also won the Michigan middle-school state forensics tournament in Declamation, delivering a cut of Facebook COO Sheryl Sandberg’s 2011 Barnard College commencement address. We’ve seen the reboot of Cosmos and we really enjoyed it. Thanks for helping to make it happen! The Sisters of the Sun episode inspired Ella to write her fifth-grade biographical paper last year on Cecilia Payne-Gaposchkin and I think she role-played Cecelia for the class. 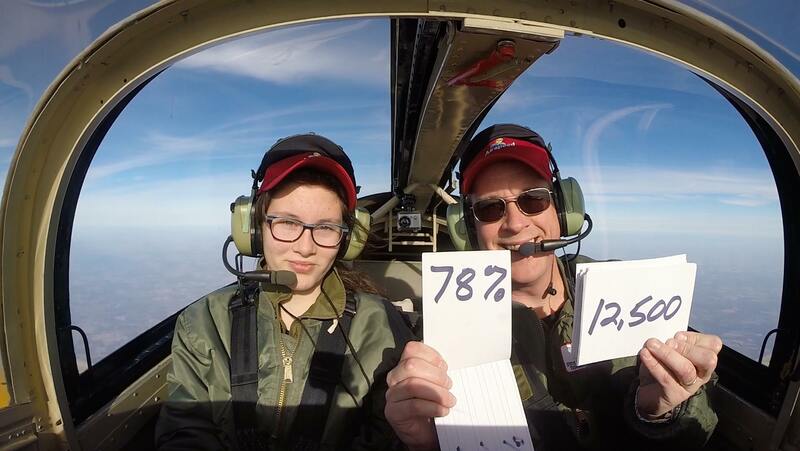 She’s also a student pilot and has been training on and off since 2015. She’ll be old enough to solo when she hits 14 and we’re making that opportunity available to her if that’s what she wants to do. Her brother, Nicholas (callsign “FOD”), soloed this summer and is working toward his private pilot checkride in 2018. I’m sure that there’s no doubt in your mind about the impact that you’ve had. But, in the unlikely event that such doubt exists, please let this e-mail be an artifact of that influence. A scientific and skeptical worldview is more important now than at any other point in my lifetime. Or Ella’s. You’ve helped to instill that in multiple generations and therein lies our best hope.